Fixes, enhances, and customise your combat experience while maintaining vanilla balance. Such as coloured facing rings and targeting lines, tune down roll correction, show distance numbers, or a detailed attack log. BTML BTML Injector must be ran everytime game is updated. The source code of the mod, including project file, readme, and setting file is licensed under AGPL v3. 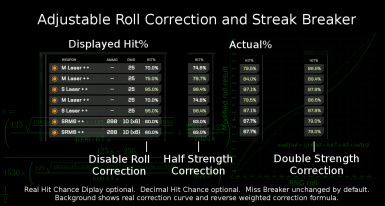 tune down roll correction, show distance numbers, or a detailed attack log. The default settings aim to preserve the balance of vanilla game. 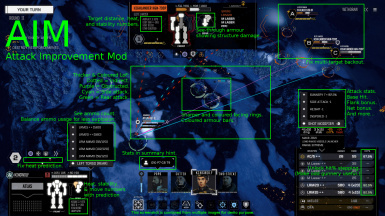 This mod does not modify game data. Saves made with this mod on will not be affected by disabling or removing this mod. ALL features can be enabled or disabled individually. Line of fire fixed and stylised: Dotted = indirect, Cyan = flank, Green = rear. Coloured facing ring and floating armour bar. Flank and rear attack Bonus. Critical hits follow damage transfer. (Optional) Allow Through Armour Critical hit (TAC). (Optional) Allow critical hit reroll and location transfer. (Optional) Allow multiple critical hits per weapon. Make sure game is version 1.3. Launch the game. The mod will creates a "settings.json" and a mod log in the same folder as mod.json. Open settings.json to see mod settings. If you want to change it, restart game to apply changes. A more detailed readme, explaining the effect of each settings and what code they affects, can be read on GitHub and is included in the package.